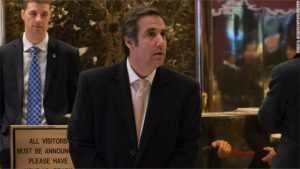 Swiss pharmaceutical behemoth Novartis announced that its top lawyer has left the company over the drug makers’ payments to Michael Cohen the personal lawyer of President Donald Trump. Group general counsel Felix Ehrat said in a statement on Wednesday that although Novartis’ $100,000 per month deal with Cohen was completely legal, it was still made in error. In all, Novartis paid $1.2 million to Cohen, ostensibly in order to learn as much as possible about the White House administration’s policy. Last week Novartis said that although it realized quickly Cohen was not able to provide the service Novartis has been anticipating, it continued paying him until his contract, signed by former CEO Joe Jimenez and Ehrat, expired during February of 2018. Ehrat on Wednesday said that as co-signatory with former Novartis CEO Jimenez, he has taken personal responsibility to bring public debate on the matter to its end. Ehrat will retire in June and Shannon Thyme Klinger the current ethics chief at Novartis will replace him. The retirement of Ehrat echoes that of Bob Quinn the top lobbyist of AT&T who was responsible for the telecoms hiring of Cohen. Apart from Novartis and AT&T, Cohen was paid as well by Korea Aerospace Industries and investment firm Columbus Nova, whose largest client of the New York firm is Renova Group, a company that is owned by Victor Vekelsberg a Russian oligarch who is Kremlin backed and has been U.S. sanctioned. The payments by Novartis to Cohen have caught the interest of public prosecutors in Switzerland, although there currently are not any criminal proceedings taking place. Jimenez has said that Cohen oversold his abilities of being able to explain the White House’s position on issues related to healthcare. He added that the company had continued paying Cohen because of the fear of litigation over prematurely terminating the agreement. Jimenez added that Novartis should have parted ways with Cohen the moment it knew he would not be of help. He claimed Cohen had said to him that he did not for Trump when the contract was signed. Earlier in the week, three senators, all Democrats, wrote to the Novartis and AT&T CEOs suggesting that the companies payments made to Cohen raised questions about corruption.